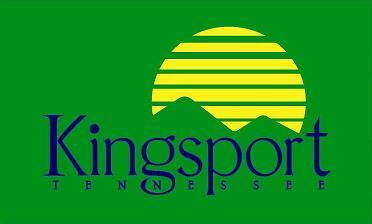 The flag of the City of Kingsport, Tennessee, shows a rising sun with green lines over it, over mountains, and "Kingsport" in blue letters below, all on a green background. It can be seen on a photo on Waymarking website: www.waymarking.com/gallery/image.aspx?f=1&guid=a65d97d1-4fd4-4d26-bebd-a5d42ae7d8d7. "Kingsport is a city in Hawkins and Sullivan counties in the U.S. state of Tennessee. The majority of the city lies in Sullivan County. The population was 44,095 at the 2000 census.' - from Wikipedia: en.wikipedia.org/wiki/Kingsport,_Tennessee. 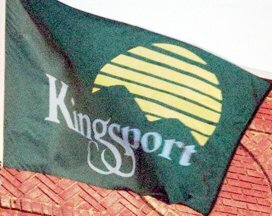 A little different design of the city flag is shown on the announcement about the new city flag on the city website dated 14.10.2009, from the one on the photo above: www.kingsporttn.gov/?q=city-kingsport-releases-new-city-flag. Maybe the produced flags were altered for easier manufacturing. Here is description: "The City of Kingsport has developed a new city flag. The flag is green with blue lettering and is highlighted by a symbol of the view one sees from the city as the sun sets over Bay's Mountain."